There are several accounts about the origins of the Tinneny family, from where they came and how they came to settle at Goladuff in County Fermanagh, Ireland. These have been passed down through both family and local tradition in Ireland. Mary Tinneny O'Kane remembered her grandfather Tommy, who was born in Belturbet, County Cavan, Ireland in 1856, telling her many times that the family came to Ireland with the Vikings during the Norman invasions. He attributed the woodworking occupations of generations of Tinnenys to his ship building Viking ancestors. Likewise, he attributed the red hair, which tends to be quite prominent in the family to this heritage. Then there is the Spanish connection. James J. Tinneny Jr., the grandson of Yankee Pat and great-grandson of Big John Tinneny of Goladuff, recalled his father telling him that the family had left Ireland during the time of Cromwel's persecutions and that they went to Spain. In Spain they settled near a Catholic seminary in the town of Salamanca. The seminary trained Irish men for the priesthood and following their ordination they returned to Ireland to minister to the people. James told his son that at some point the Tinnenys returned to Ireland but he did not know when. James Jr. thought he was told that the family lived in Armagh when they returned, however, I've found no evidence of this. Armagh is located about 30 miles from Goladuff. From the other side of the Atlantic Ocean in a conversation with a Kim Tinneny, who said she was the wife of Robert Tinneny living in London, I was surprised to learn of another reference to a Spanish connection. In response to my inquiry, as to where Robert's family came from, I was told that they were believed to have originally come from Spain. She had no further details on this Spanish connection. She did know that Robert's family had immigrated to England from Belturbet in the early 1900s. The fact that stories of Spain in our background have come down through 3 or 4 generations of Tinnenys on different continents, who did not know of each other and whose branches of the family had not been in contact for over a hundred years, adds credence to the idea that there may very well have been a Spanish connection of some sort in our past. Both family and local tradition in Counties Cavan and Fermanagh in Ireland indicate that the first Tinneny settled at Goladuff about 1689. It is believed that he and a comrade-in-arms named Tummin were soldiers in the army of General Justin McCarthy, which was part of the army of the ousted Catholic King James II of England. Following is an account by an unknown author that describes the engagement. In the winter of 1689 the army of James II, including McCarthy's unit marched north through Ireland and saw much action against the Protestant army of William of Orange in southern County Fermanagh. McCarthy's plan was to capture Crom Castle, which was an outpost for the town of Enniskellen located along the upper part of Upper Lough Erne. The first attempt of McCarthy's Army to take the Castle in July was repelled by the troops of Colonel Berry. A second encounter between the two forces took place, the same day near the town of Lisnaskea, which is also in County Fermanagh. The second encounter ended in the failure of McCarthy's forces to meet their objective. One section of the army marched down the Derryvona Road. They crossed the River Erne at a narrow pass at Inishfendra and were advancing toward Crom Castle. They had used boats, called cots, which they tied together with gads (the Gaelic word gad means a rope or tying) to form a pontoon bridge to facilitate crossing the river. On their return from the battle they found that the gads had been cut and the cots had drifted down the river. Thus, their retreat was blocked and the Williamite Enniskilleners were in hot pursuit. No mercy was shown as this faction of McCarthy's army was slaughtered. They had been backed up to the river with no place to escape. Since that time the place has been known as the "Bloody Pass." It was from this battle of the Bloody Pass that a Tinneny and a Tummin were said to have swam off and escaped and found their way to the small island like peninsula of Goladuff which is not far from the Bloody Pass. A mass grave was dug on the bank of the River Erne at the Bloody Pass and as many as 500 men are believed to be buried there. 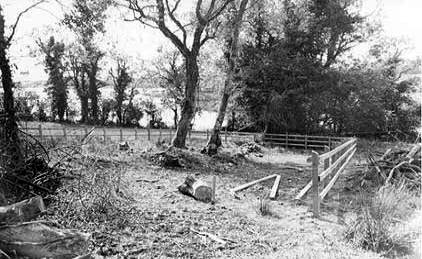 This burial ground of the slaughtered section of McCarthy's army is known as Cuilleann (Holly) Burial Ground. In April 1987, while she was a student at Saint Bricin's Vocational School in Belturbet, Fidelma Tinneny, the daughter of Hubert and great-great-granddaughter of "Big John" Tinneny, headed up a project with her classmates which researched, cleared and fenced the long overgrown burial site of the Irish patriots slaughtered at the Battle of the Bloody Pass. A different account of how the Tinnenys came to Goladuff was provided in 1992 by Mr. Francis Fitzpatrick "Francie of the Key" of Derrydoon near Goladuff. Francie was a local historian. He said, that as a young boy he remembered an old man by the name of McElgunn telling him that the Tinnenys had been relocated to Goladuff several hundred years before from the town of Urney. Urney is located near Belturbet, County Cavan, which is across the Quivvy Lough from Goladuff. At the time it was quite common for the British landlord in the area, who had an estate covering 40,000 acres, to move his tenants around at will.